Raith Rovers midfielder Ross Matthews believes he is improving under John McGlynn. The 22-year-old has enjoyed an extended run in his preferred central midfield position in recent weeks and feels his form is benefitting as a result. “I feel I’ve been massively improving under the new gaffer,” Matthews said. “The big thing he does is video analysis and it’s definitely helping me. “He picks me out and tells me things I could do better, as well as things I’m doing well so I keep on doing it, and I think I’m taking it on board. “There were certain things I did on Saturday which he told me I needed to improve from the previous week. “I just needed that run of games in the middle as well. “I’ve been playing in different positions and not had time to improve and build my confidence. I think that’s coming now. “I felt like I got that chance at the start under Ray McKinnon - he knew my game. “But since then I’ve been playing a bit out of position. “I’ve been doing a job for the team but I know it doesn’t bring the best out of me. Matthews certainly impressed against Airdrie on Saturday with his returning confidence apparent in the way he snarled into tackles and demanded the ball. 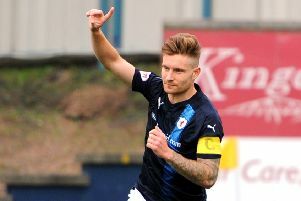 “In the first five minutes we didn’t start that well, but once Nizzy scored, everyone got a lift from that, and from then on that’s some of the best football we’ve played since I’ve been at Raith,” he said. McGlynn’s first spell as Raith boss came to an end just a few months before Matthews joined the club in 2013, and he has been impressed with the manager’s meticulous preparation. “From my point of view, I know exactly what I’m doing when I go onto the pitch,” he explained. “I know exactly where other players are going to be as well because we work on it so much in training. “I know where Dan Armstrong will be – sometimes I don’t even have to look. “I know either Nizzy or Buchs is going to drop in and help me, and then I’ve got Nat next to me, knowing if I don’t win a ball, he’ll win it. Raith’s recent run of victories has failed to dent Arbroath’s 10-point advantage. “We’ve dropped too many points and there’s nothing we can really do about that now except keep winning games,” Matthews said. “We just have to concentrate on ourselves and hope they slip up. If they keep up that winning streak then we just have to say fair play to them. “But you saw how much it changed last season, and we’ll still got to play them three times, which will be massive games for us.